Thailand’s Democrat Party together with Asiola, a crowdfunding curated for Thailand, organized a campaign at Siam Motors’ Dr. Thaworn Phornprapha Hall earlier today to help fund the “English For All” project. Former prime minister Abhisit Vejjajiva, former finance minister Korn Chatikavanij, former MP for Phitsanulok Dr. Warong Dechgitvigrom and the founders of Asiola, discussed the problems Thai students experience in learning English, the “English For All,” and on how to help these poor students coming from poor farming families to be able to learn English for free thru crowdfunding. 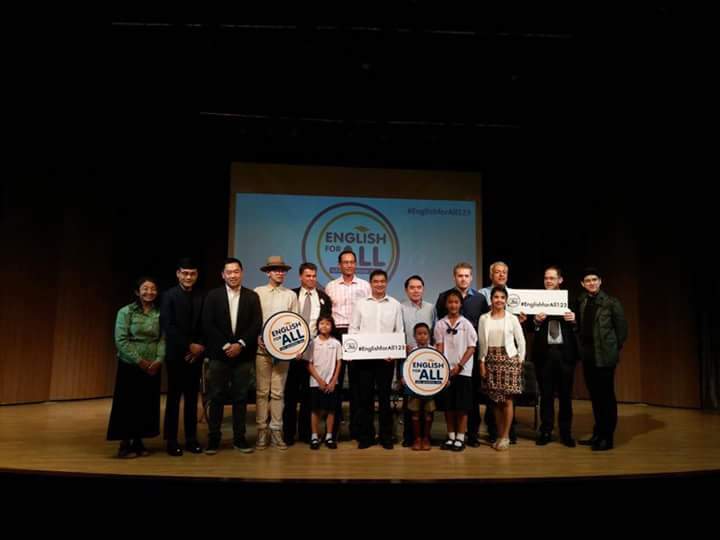 “English For All” is a project Dr. Warong, Khun Korn, the Democrat Party and myself, helped established in 2014. The aim of the project is for Thai students to have access to quality education and learn English from foreigners with emphasis on fun and conversational learning. The project received positive responses from parents who used to be not so much attached to what was happening at school. Seeing their kids utter English words even at home made them to have a change of heart and forced them to request to have this project continued. But due to lack of funding we can’t really tell what the future holds. That’s when Asiola, a crowdfunding company, came into picture. Crowdfunding is a way of raising funds for a project by bringing together a group of supporters who will individually invest in order to make it possible. If enough people get behind an idea and contribute towards it, they can make it a reality. To get to know Asiola more please visit their website at http://asiola.co.th/en and the English For All Facebook page at this link https://web.facebook.com/englishforallthai/?fref=ts.